the little mermaid. — halthegal. "a little love larger than the sea." faerie tale feet piece inspired by hans christian andersen's "the little mermaid." the original story is a bit more complicated and tragic than the fine 1989 disney animated film, but the point remains: love can transcend an ocean, the land, and the air itself. i invite you to read the original. it’s not just the little mermaid (sorry, she’s never given the name “ariel,” but it is a pretty name! )’s love for the prince that makes her want to become human, but her overwhelming fascination with and desire for an immortal soul like humans have. when each of the little mermaid’s sisters turn fifteen, they are allowed to visit the surface on their birthdays. when it’s finally the little mermaid’s turn (she has five older sisters), she sees fireworks and a tremendous shipwreck. carrying the handsome prince to shore, it is a girl at the convent that gets the credit for saving the prince’s life. the little mermaid eventually discovers where the prince’s kingdom is, visits the sea witch, who cuts out her tongue and gives her a magic potion that will give her legs. while she will be the most graceful human, every time the little mermaid takes a step on land, it will feel to her as if she’s walking on shards of glass. i’m giving the whole story away… but i will say this: the little mermaid dances for the prince and is allowed to sleep on a silk pillow outside his bedroom door as a reward. the prince goes to another kingdom to visit a princess his dad wants him to marry and it turns out to be convent girl, so they get married. the little mermaid’s sisters cut off their hair so the sea witch gives them a dagger that the little mermaid can kill the prince before the sun rises the day after his wedding so she can turn back into a mermaid. otherwise she’s become sea foam (what happens to all merpeople after they turn 400 years old). because she loves the prince too much to kill him, she throws the dagger into the sea as the sun rises. instead of becoming sea foam, for her selfless act she is granted immortality, but as an element of the air, and she watches over the prince and his new bride ever after. stinks for her, but i guess the prince is happy…? anyway, i loved painting her luxe fin in layers and layers of gouache. and the background icons allude to both life under the sea (you’re singing that song in your head now, aren’t you?! ), the clam shells and pearls her grandmother adorned her with when it was her turn to visit the surface for her birthday, the red flowers the little mermaid planted in her sea garden in the shape of the sun, a treble clef for she was the best singer in the ocean (and above land if she could have sung then), the silk pillow she slept on outside the prince’s door, the potion that made her human, her other sisters, the dagger that cut off her sisters’ hair and that could have killed the prince, the useless anchor of a ship at sea in a storm…. and hopefully the aura of living life, in any form, to LOVE. have a look at the painting process below! once i decided on the icon shapes i wanted to use in the background pattern, i start tracing them to fill in the background around the mermaid’s tail. here’s the full background pattern once all the icons have been traced– ready to transfer to illustration board! once the pattern is transferred to illustration board, the first paint colour i mix is the background colour– which typically informs the colour scheme of the whole piece. so here you see me starting to paint in sea blue around all those icon shapes! 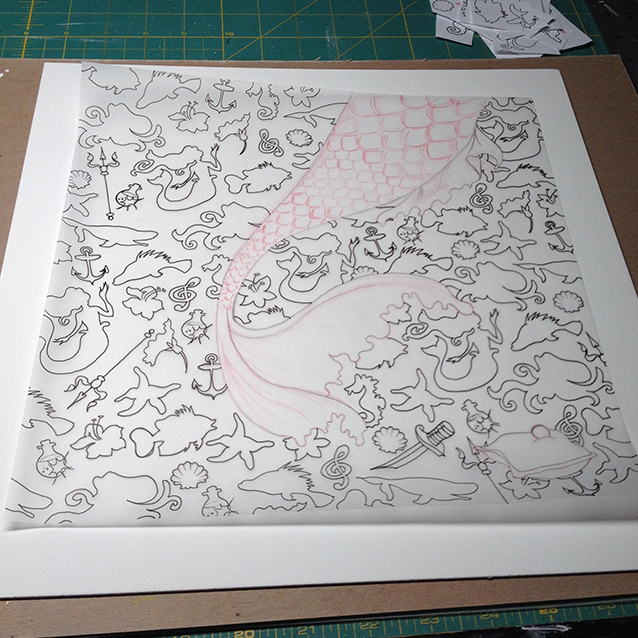 once the background was finished, i started painting the little mermaid’s tail. layers and layers of green to make the scales… so much fun! again with the details on the fin scales. added some red to make the deeper greens and shadows pop, too. woohoo for colour theory! there are lots of icons that allude to andersen’s tale and not the disney version– the pillow she slept on outside the prince’s door, the pearls from her grandmother, and, um, yeah, that dagger…. 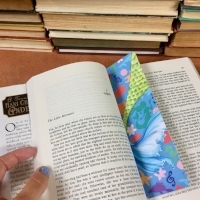 luxe bookmarks HERE & stickers HERE!! original gouache painting is still available framed in a white wash wood frame for $575 (+$40 for safe u.s.a. shipping.) contact me!